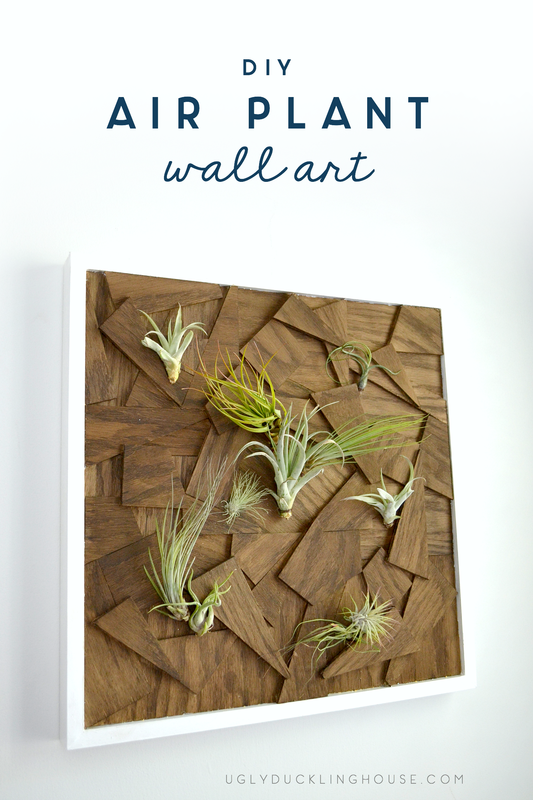 Using scrap plywood, I created this DIY air plant wall art in no time at all. Originally, I was thinking of combining my recap of the WorkbenchCon and this DIY idea, but it got WAY too long! So, I’m splitting them up today into two back-to-back posts so you can get more details. 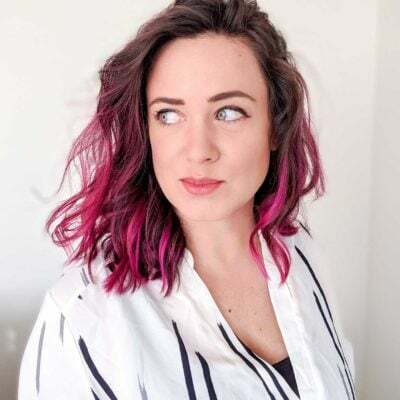 Read all about my experience with building a booth for Rust-Oleum for the first-ever WorkbenchCon in Atlanta, GA right here. 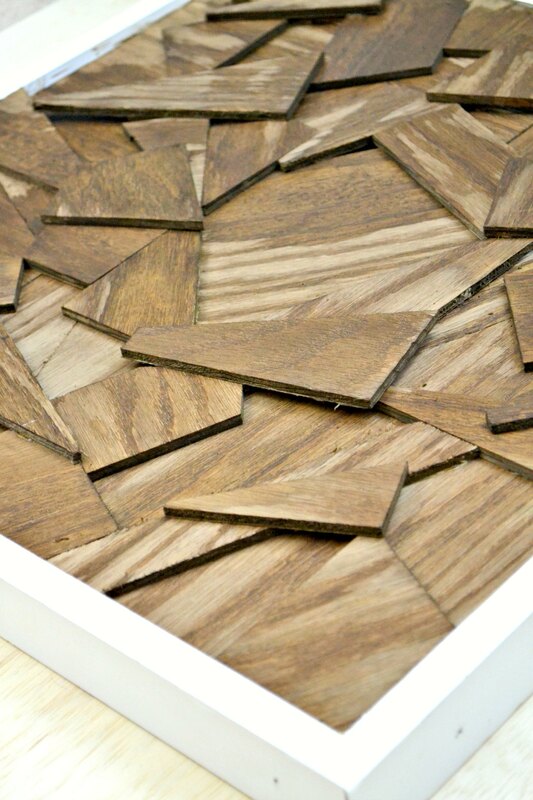 This art is inspired by the booth I created, and uses a lot of scrap wood left over from that project. 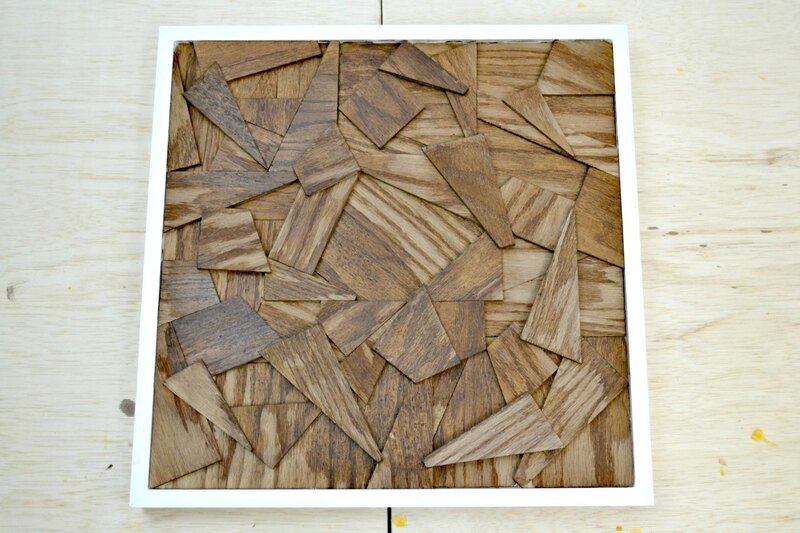 Even though this project is inspired by my booth from the WBC, it was actually first created as a backup idea for the Wood Art Challenge last month. I wasn’t 100% sure my carved wood art would work out, so I needed something I knew I could whip up quickly in case of failure. Once it came together, I wanted to see it all the way through, and boom: new art in my office! Without further ado: onto the tutorial! 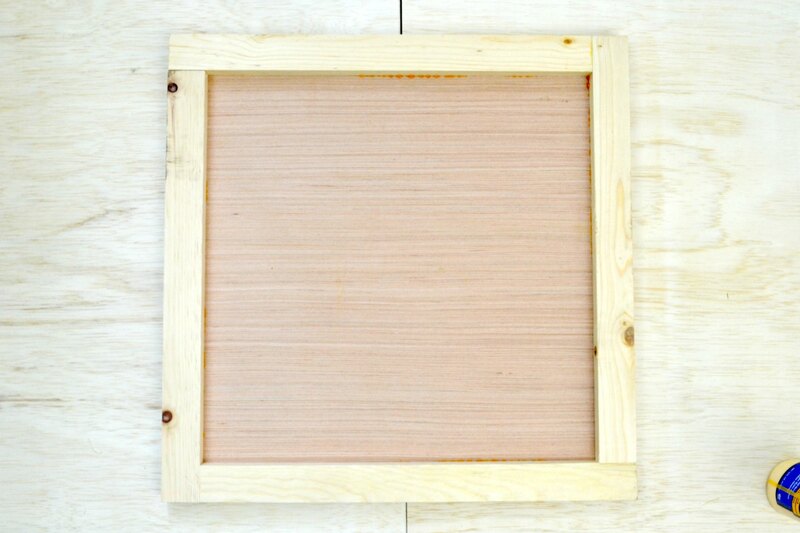 As you can see from the photo above, I began with a square frame made from cheap 1×2 furring strips (from my scrap pile — 100% of this project was scrap wood!). I glued it together and used painter’s tape to help secure until the glue was fully dry. 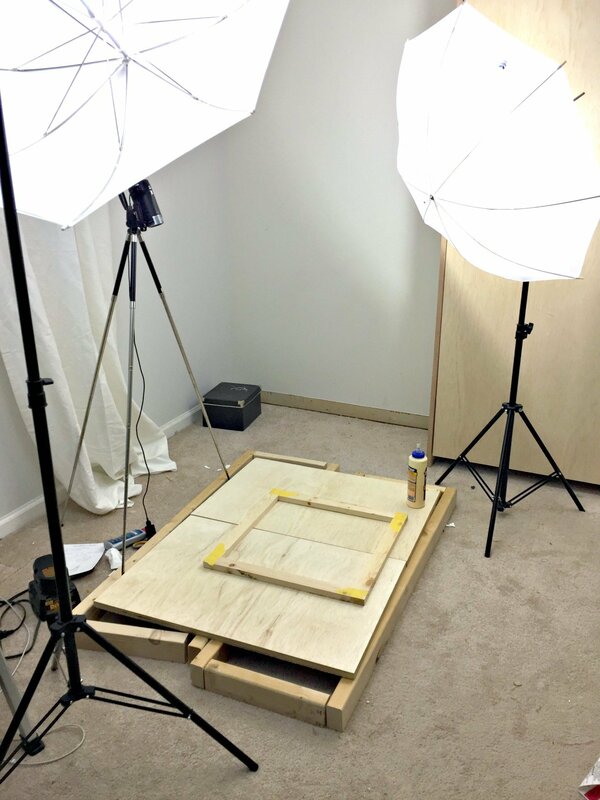 Anyway… once the frame was cured, I cut and glued thin plywood to fit the square. You can also use stiff cardboard if you have it. 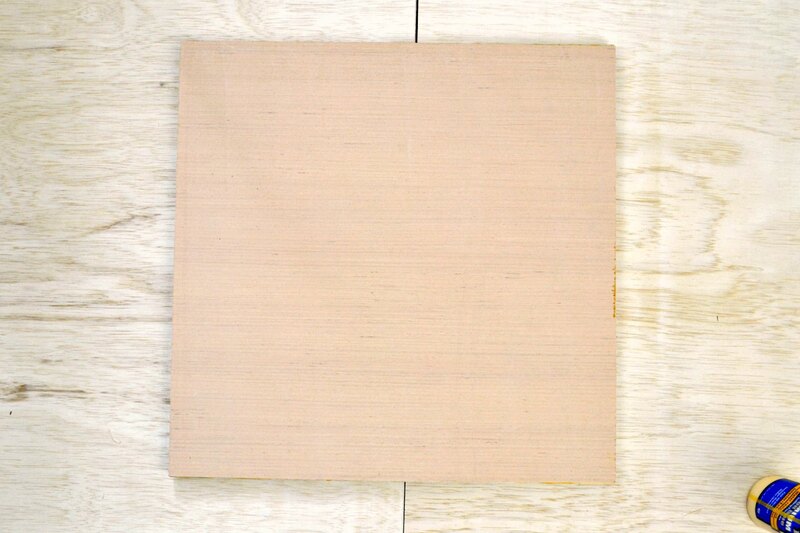 This forms the main canvas of the artwork. 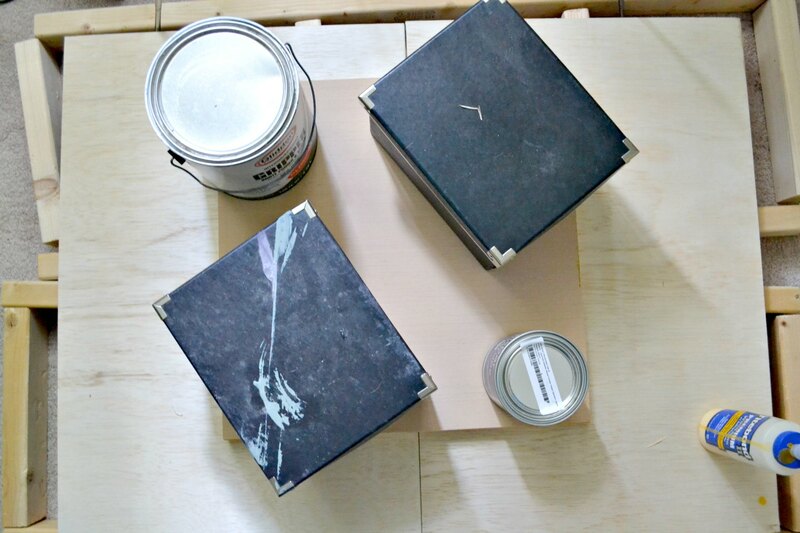 Instead of painter’s tape to hold down the front, I used anything heavy I found around the room to evenly distribute weight and keep things snug until everything was dry. Next, I added a decorative frame with 1×2 MDF turned on its side (I’ve shown this before on previous projects and it has confused folks, since I used 1x2s to make the back as well. The difference is that the back frame is laid flat. 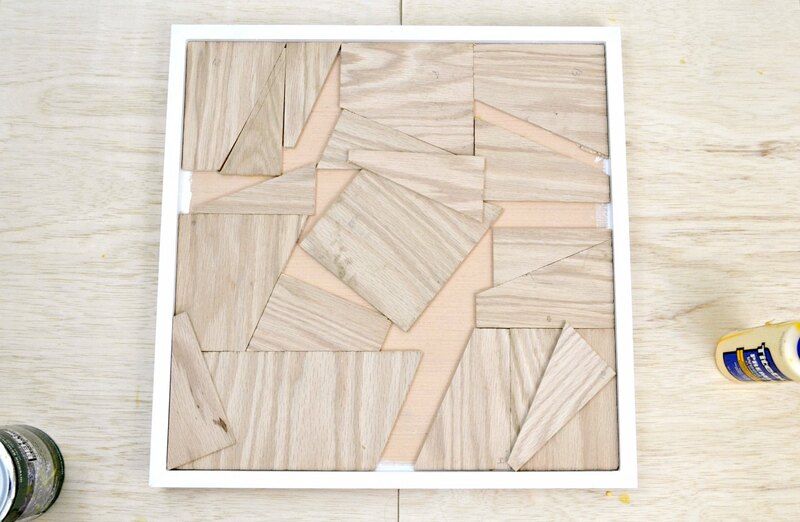 When you make the MDF frame, you turn those pieces on its side.). The corners are all mitered to 45-degrees, then filled and painted. 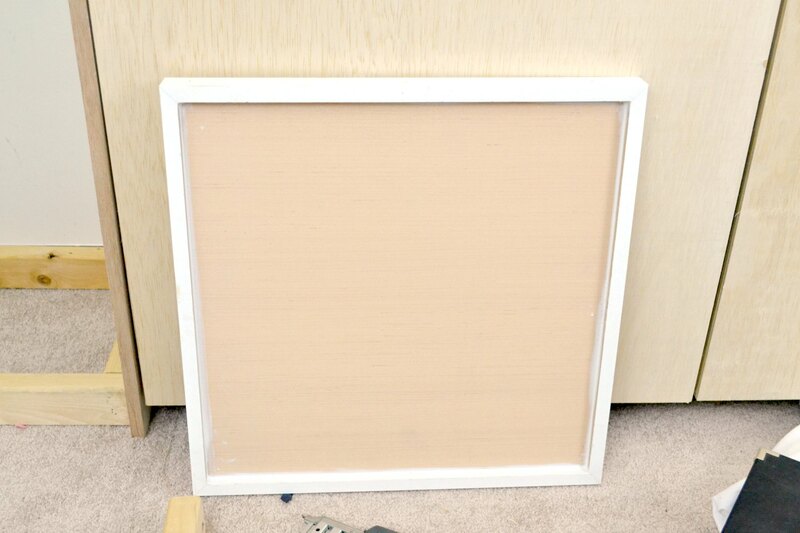 This is so there are no visible gaps between the plywood canvas and frame. 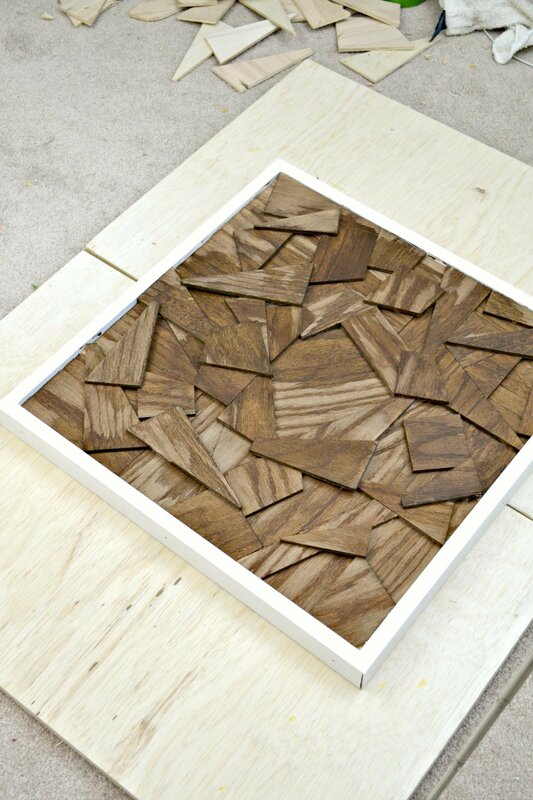 Using pieces of scrap wood, I began gluing the first layer to fill in the background as much as possible. I made sure I started with the center piece and all four corners so there would be no difficult areas to fit later. With the next two layers, I placed more and more pieces to completely cover the canvas and give me a lot of nice texture, trying to use a variety of shapes and sizes. 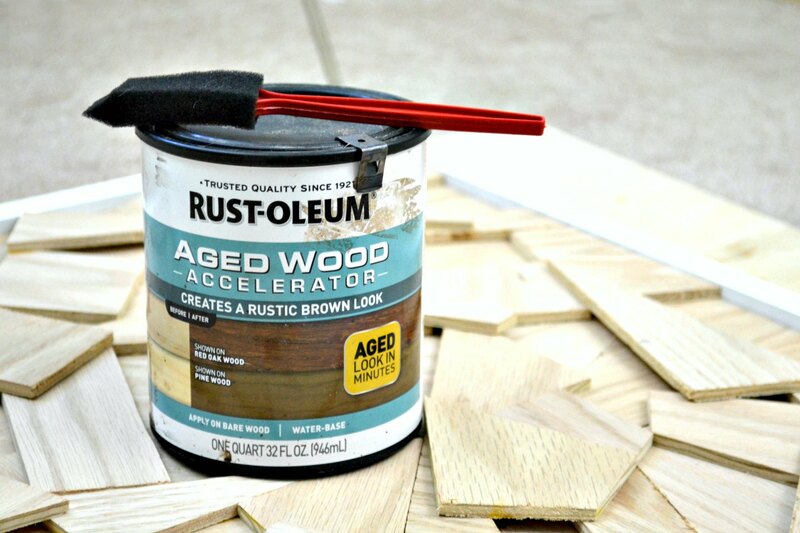 Rust-Oleum had originally commissioned me for their WBC booth to showcase their new Aged Wood Accelerator. They have a “weathered” version that makes things look gray, while this looks more brown. I wasn’t sure at first if I would even like the product before I started using it, but I’m officially a convert; it doesn’t stink like regular stain, you can be really sloppy and uneven with it, you don’t have to wipe it back off if you put too much on, and it just plain has a great color after it dries. 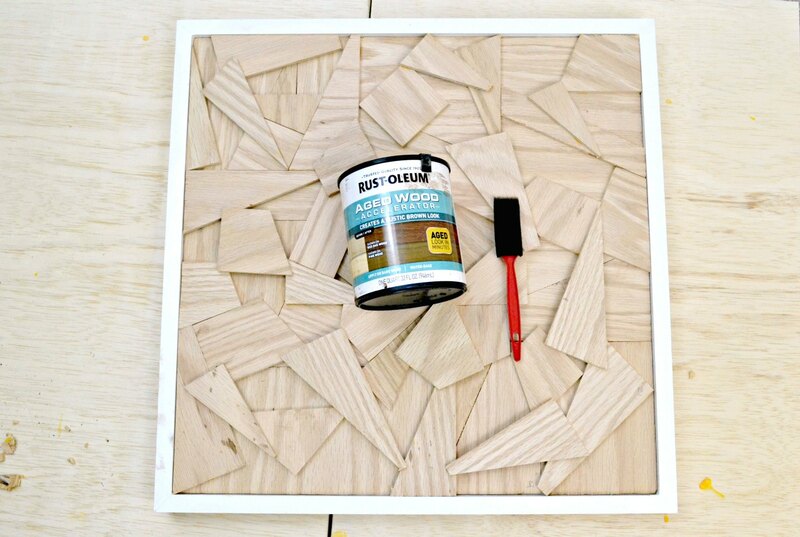 Even though it can be used on common boards, I highly recommend using it on red oak. It really brings out the grain and the slight red tinge looks nice and rich. 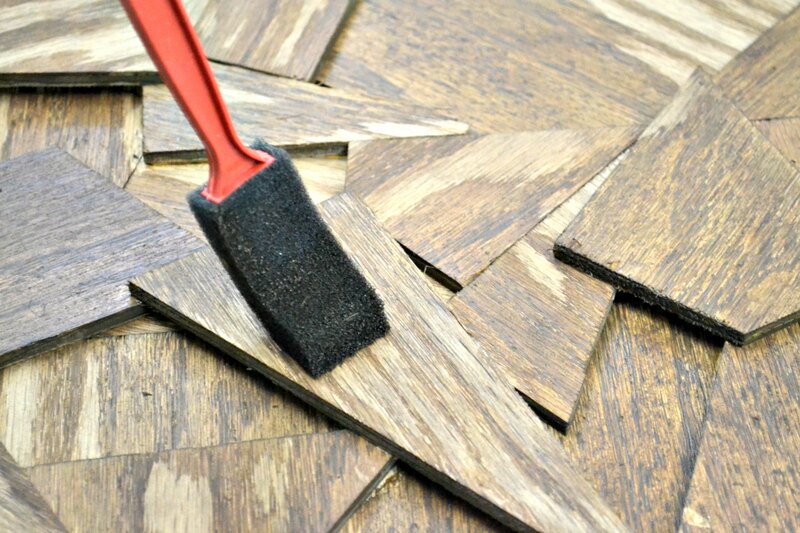 A little sponge brush is great for application because it lets you get into all the little nooks and crannies (turn the piece around and around to make sure you don’t miss spots). 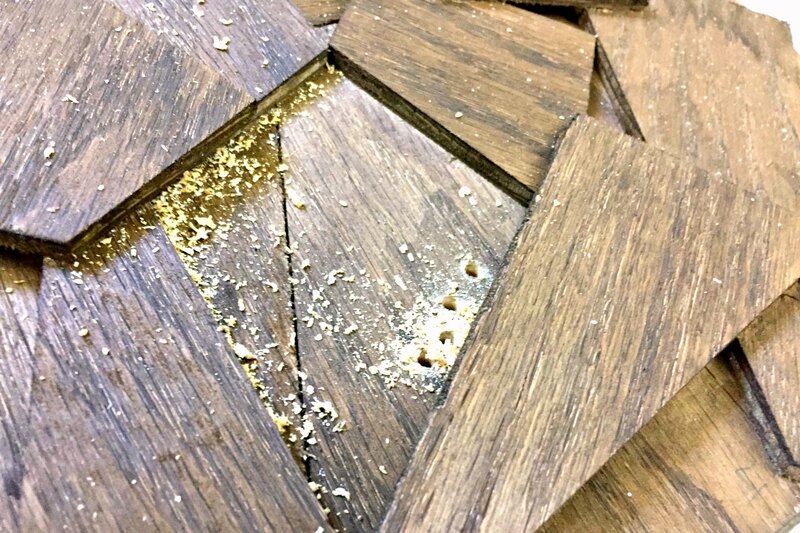 The rough edges of the plywood cuts handle the product extremely well and practically makes tearout invisible (it’s supposed to look rustic after all, so it just looks like it’s on purpose). As the wood accelerator soaks in, you can see parts dry up and some will keep soaking in. I didn’t worry at all about wiping any of it off; that’s part of what makes the product easy. It is possible to add a second coat if you want (I did). 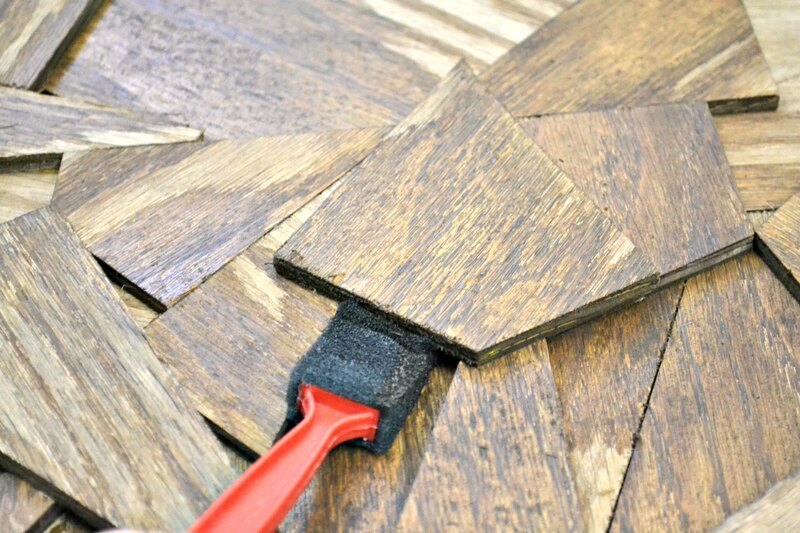 Like stain, the second coat will darken the first. As things dried, I took some time to touch up the MDF and paint over any nail holes. 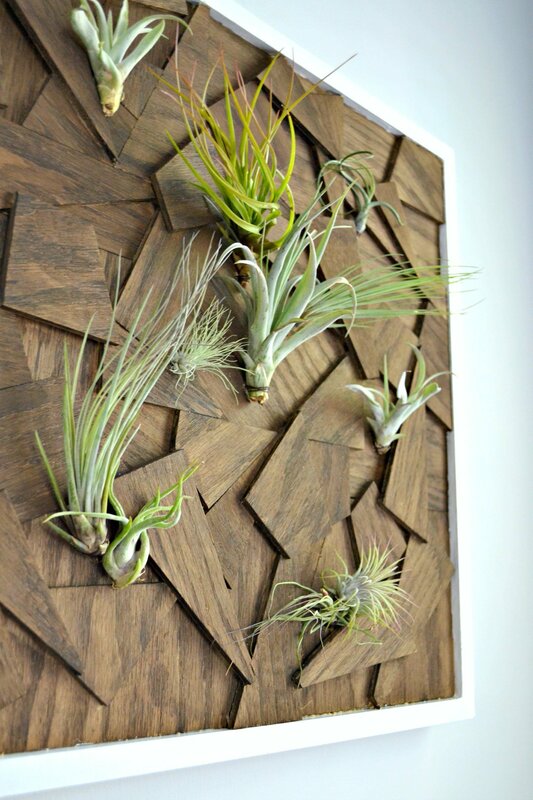 Next, it was time to add air plants. I ordered this bundle from Amazon, which also came with fertilizer spray. I raided my stash of jewelry making supplies to find some thin brown craft wire (similar). 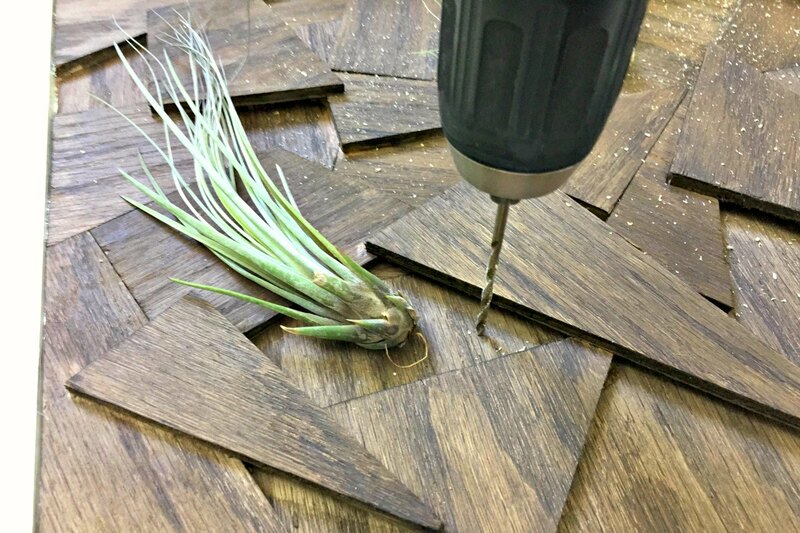 After fussing with placement, I drilled 2 holes in each spot where I wanted an air plant using my drill. In places where I had more than one plant, I still drilled 2 holes for each plant. That way, I could control precisely which direction the plant would sit. Placement using the wire occurred in one of two ways. 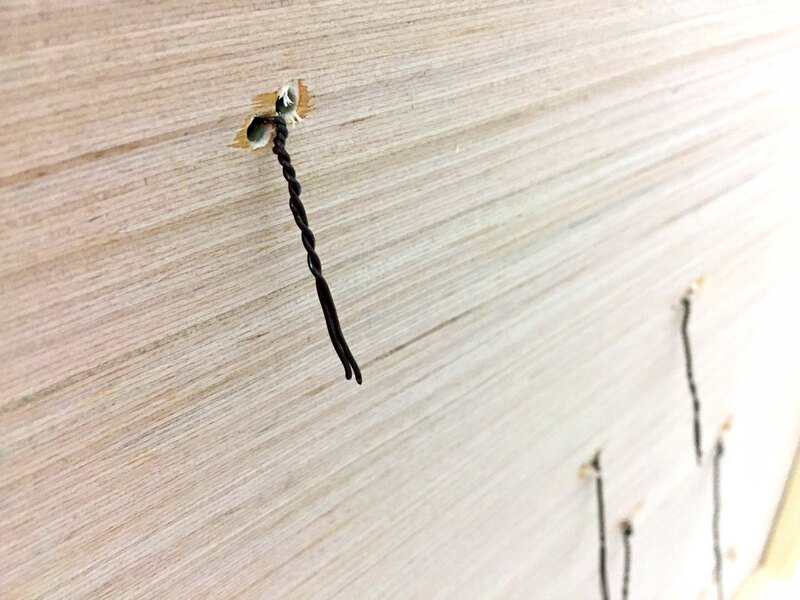 For most, after threading one side through the back, I would wrap around the base of the plant several times and feed the other end through the remaining hole. Once both ends were through the back and taught, I twisted them in place to keep the plant secure. 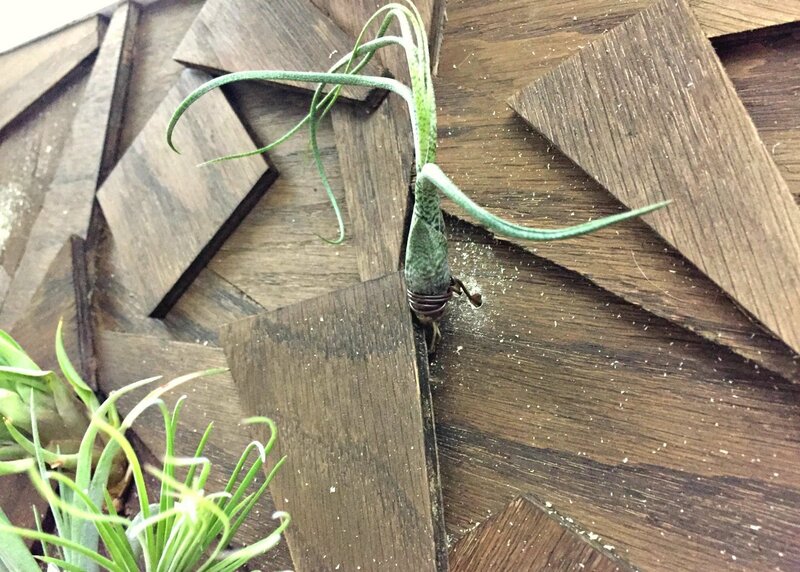 Alternatively, on a few of the thicker plants without a stem to wrap, I threaded the wire through parts of the plant and then secured it to the wood. Don’t pull too hard. I kept going with each plant, starting in the middle and fanning outward. Using my favorite new flush mount hangers (I LOVE these things and they hang so well! ), the art piece found a new home in my office! 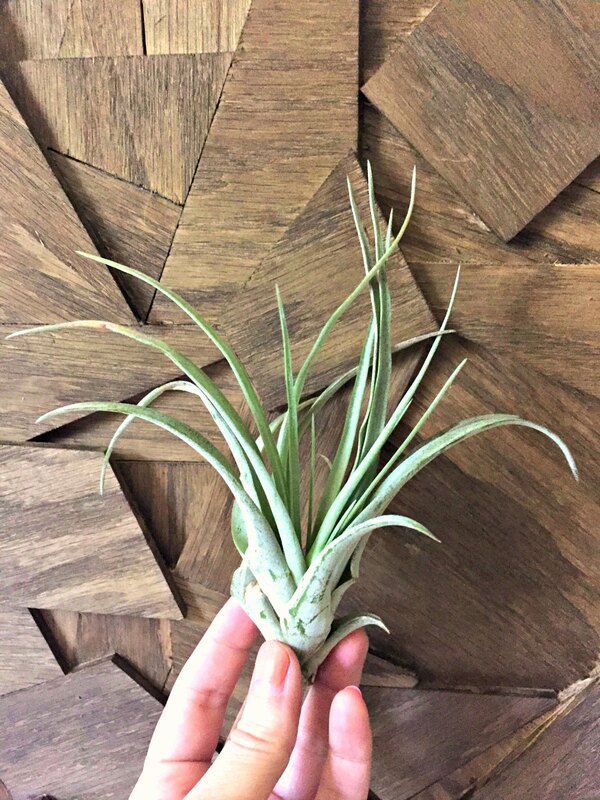 How do you care for the air plants? I plan to water them with a water bottle regularly. 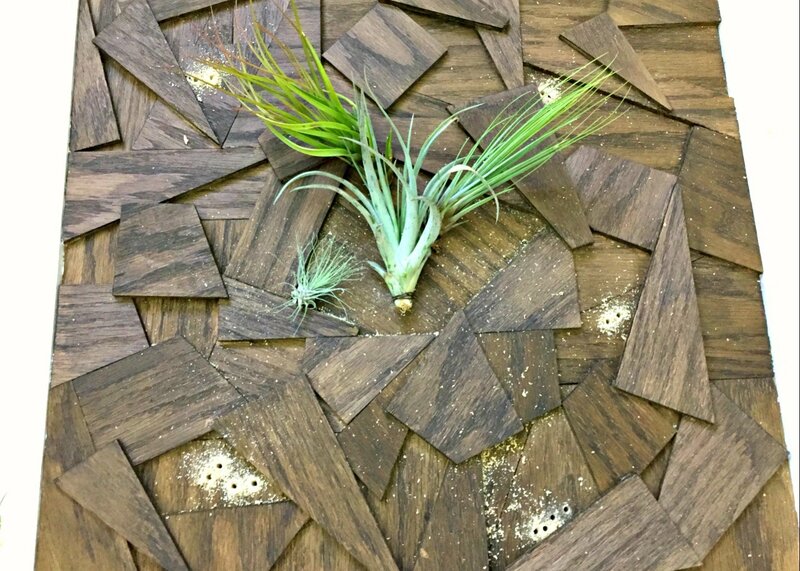 The air plants also came with a spray fertilizer (link to the ones I bought in the post). 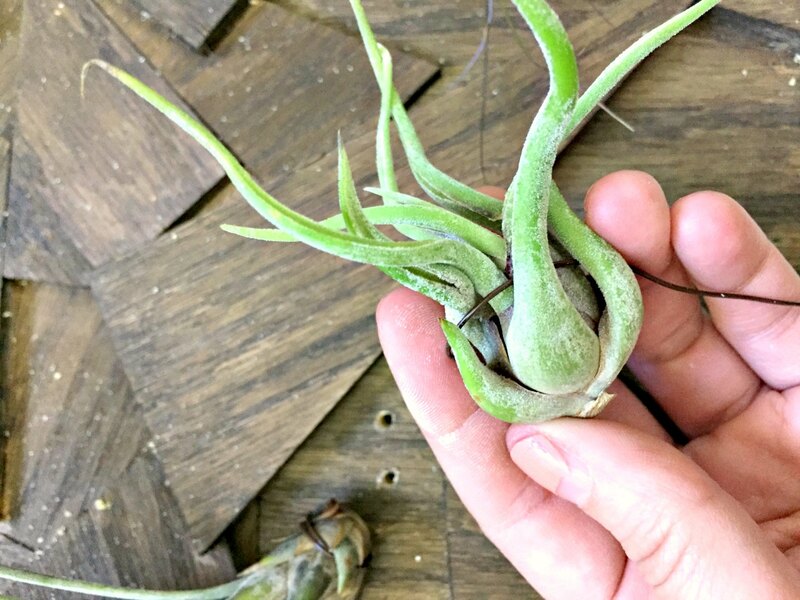 I’ve never had air plants before, so I’m hoping I get into a routine that keeps them healthy. I think the food items might need more direct sunlight like you said, but the new vegetable garden is right next to where the shed will be. I didn’t think about using them in cocktails next to the bar but that’s genius!! 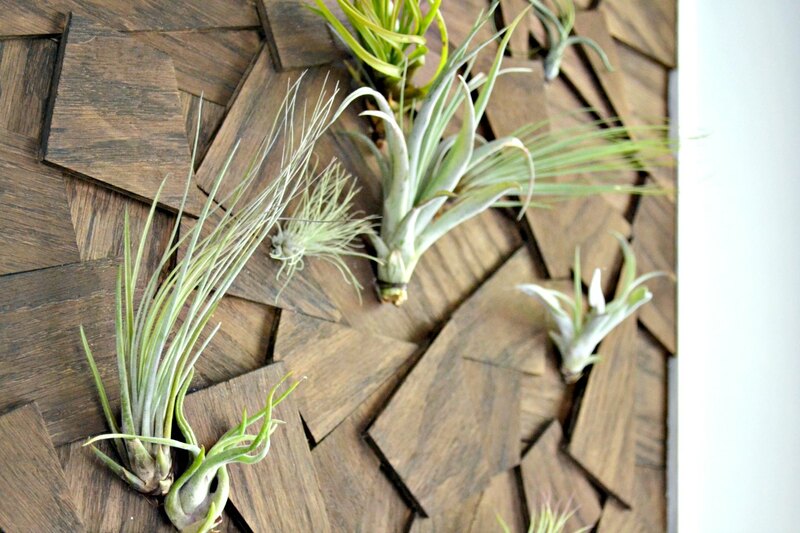 And air plants: they don’t need soil to grow, so they can basically grow anywhere that’s in bright filtered light. The only challenge (so I hear) is keeping them regularly watered. The way I made this, I’m planning on misting them regularly. If they need more than that (like soaking), I may have to redo the wiring so that they can be pulled off/on the art, but we’ll see. The plants I ordered came with fertilizer so I think I’m in good shape to keep them happy so far.